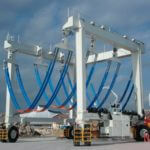 30 ton travel lift is a great choice for lifting and transporting boats. 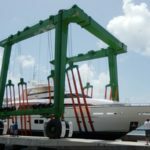 With amphibious features, the crane can be used for lifting the boat from the water or putting the boat in the water, or transporting the boat on the land. The multiple lifting points can work together at the same time. The sling is strong and soft. It hardly does harm to the boat surface. 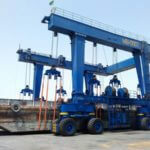 U shape design makes boat hoist gantry crane large loading capacity. It can lift the boat that is higher than the crane itself. Travel lift 30 ton has wide application. It can be used for aquatic clubs, water sport meetings, port, boat factory. The crane has operation ways as cabin control and remote control. Our company is a professional travel lift manufacturer in China. 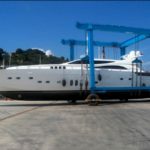 We provide customized mobile boat hoists for sale, such as construction travel lift, dock travel lift, remote control travel lift, cabin control travel lift, light duty travel lift, heavy duty travel lift, hydraulic boat hoist, electric boat hoist crane. These China manufacturer travel lifts can lift and transport the boat stably and quickly. Want to get a reliable 30 ton travel lift? 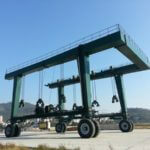 Just send inquiry to sales@marinetravellifts.com . It can reduce structural stress and get maximum rotation to accommodate extreme yard conditions. The articulated pivot trunnion allows your mobile boat hoist to travel over uneven ground, including unimproved dirt and concrete. 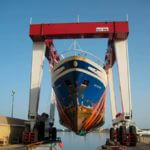 Its function is to optimize the diversity of vessels your boat hoist can lift and maximize its lifting capacity. At the touch of a button, the operator can adjust each sling’s position to improve load balance and avoid stabilizers or other sensitive elements on the hull. The hoists provide operators with full control of the load with separate independent control levers for each hoist. Separate pumps power each hoist, helping to synchronize every lift. It can prevent hull damage and balance loads with the continuous reeving system. Our block and spreader configuration allows the slings to move around the vessel’s hull while keeping your block leveled. By allowing the spreaders to pivot in all directions, you can avoid overloading slings and the ability to accommodate several diverse hull configurations without wire rope and sheave wear. It is designed to improve operational safety and maneuverability. The wireless remote control increases visibility of the boat, launching piers and surrounding area. Quick and easy access to all controls so the operator can lift and move the mobile boat hoist with precision. It can also serve as a mechanical backup for the optional wireless remote control. It can reduce fatigue and extend the life of your machine with a beam formed structure. 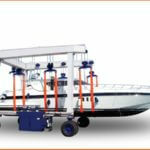 It gives the boat hoist more strength for more heavy-duty work year after year. It provides greater versatility with easy reconfiguration of the boat hoist’s dimensions to meet various hull requirements. Eliminate wire crossing and reduce wear to increase the life of the wire rope. Resists corrosion in harsh marine environments with stainless steel tubing. Protect slings from chafing and abrasions with rubber-reinforced coverings that extend the life of your slings. Prevent leaks and blowouts in the hydraulic system. 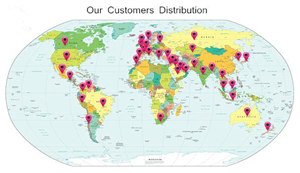 Protect hoses from harsh elements, damaging UV rays and abrasions for longer service life. 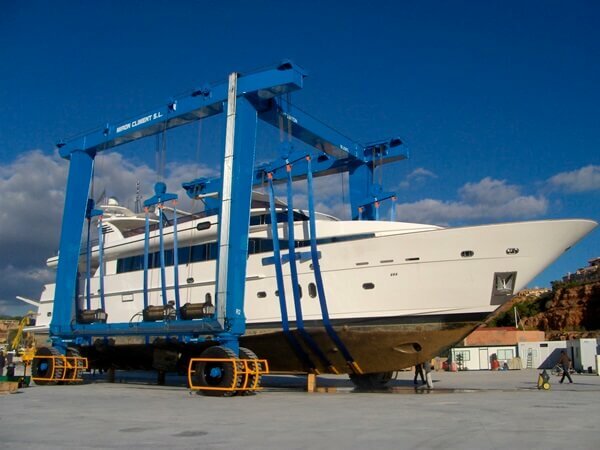 Ensure 100% of available travel height and easily hoist tall and diverse vessels up to the very top without damage.